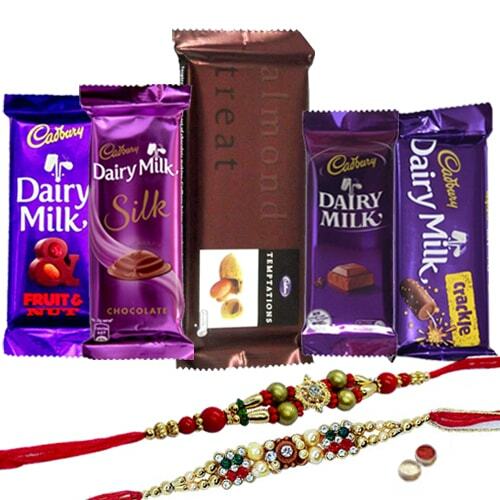 Celebrate the spirit of Raksha Bandhan by ordering for the people you love, this Enthralling Gift of Chocolaty Cadburys Chocolates Hamper adorned with a Rakhi, Roli Tilak and Chawal free of cost. The hamper includes Cadbury Dairy Milk Crackle, Cadbury Dairy Milk Fruits N Nuts, Cadbury Dairy Milk Silk, Cadbury Temptation and Cadbury Dairy Milk. The Pattern of the Rakhi may comes with variation.